Modern banking originated in Italy around 1150 as Jews fleeing persecution brought new practices, including “discounting,” to the merchant banks of the Italian piazzas. Modern forms of interest-charging moneylending, merchant banking, stocks, interest bearing deposits, insurance, credit, currency exchange, and more all arise from this marriage of cultures in the trading centers of the Italian Maritime Republics. Early forms of banking and charging interest had existed as long ago as 5,000 BC, if not earlier. See banking in Ancient Egypt, Ancient Greece, and Ancient Rome for instance. Early non-interest charging merchant banks had been established around the grain business in Italy prior to that. The origin of today’s interest-charging international banking system began in the Italian trading centers of the mid-to-late 1,100’s. Jewish, Christian, and Muslim religions all ban usury (charging interest), as did many cultures throughout history. Banking that involved charging interest was not a common practice until the Jews and Italians worked together to find a loophole in their religious texts. This loophole (shown in red below) led to the birth of merchant banking, the birth of modern banking, and the birth of international banking. In many ways, it led to the birth of classical liberalism. Along with the printing press and Protestantism, it may be said to have led to the rise of the West. “Thou shalt not lend upon interest to thy brother: interest of money, interest of victuals, interest of anything that is lent upon interest. Unto a foreigner thou mayest lend upon interest, but unto thy brother thou shalt not lend upon interest; that the Lord thy God may bless thee in all that thou puttest thy hand into, in the land whither thou goest in to possess it.” (Deuteronomy 23:20-21). Banking Explained – Money and Credit. The difference between usury and interest: Although the terms are somewhat semantic, interest is the act of charging someone to borrow money and usury can be seen as charging unreasonably high interest rates, as a loan shark would. Thus, although each culture is different, the roots of the anti-usury laws are more about outlawing the charging of high interest by moneylenders than outlawing interest or related fees in banking. The fees charged with discounting, which was an early form of interest that arose from the loophole described above, and even the fees charged in banking today, are notably more in-line with reasonable interest than usury or loansharking. THE EVOLUTION OF BANKING: The roots of banking are as old as the first minted currencies. Records from Ancient Greece, Rome, Egypt and Babylon suggest that early forms of banking including loans and deposits occurred in Temples where interest rates were either outlawed or controlled by the state. The Roman Republic, the precursor to the 1,100’s Italy, had a banking system, but charging interest was occasionally outlawed and then complicated by the use of the Roman Numeral system which doesn’t allow for nuanced place-value. Learn more about the Evolution Of Banking. The story of banking is the story of a partnership between the Italian grain merchants and the Jews in the Maritime Republics. Many Jews had originally lived in Muslim Spain and then in Catholic Spain prior to the Inquisition. Others had lived in England prior to the massacres of Jews at London and York in 1189–1190 and the Statute of the Jewry passed by Edward I of England in 1275. Others traded in the Far East on the silk road where they developed practices now considered common in merchant banking to finance their travels. After leaving the Silk Road, being driven from England, and being driven from Spain under the Almohad Caliphate in the 1,100’s and then again in the 1,400’s under the iInquisition, the Jews took their banking practices to the Italian trading centers. They were forced to live in Jewish Ghettos (the first Ghettos) in Italy. The Jews began to work with the already established Italian grain merchants, trading centers, and their non-interest charging merchant banks, which were the first merchant banks in modern history, old Roman banks aside. After some evolution under Machiavelli’s Medici family starting in the 1400’s, and then under the Protestant revolution and the East India Companies in Britain and the Netherlands, these interest charging “banks” evolved into our modern day banking system. Meanwhile, the other financial products became our whole finance industry from insurance, to stock markets, to central banks, and more. If not for this bit of history, which facilitated the boom in trade that essentially created the modern West, world history would have looked much different. Just imagine an America where one couldn’t get a loan for a car or home, in which there was no stock market or insurance products, where Apple couldn’t get venture capital to build its Mac, or where a system of debt and credit didn’t create an incentive of peace between historically warring nations. It isn’t just banking that allows this, but the incentive of interest. The Jews of Italy partnered with the Italian grain merchants and early merchant banks, introduced new banking practices which allowed for improvements in the grain industry, and took on roles which the Church had forbidden to Christians of the time. Muslims and Christians couldn’t charge interest on loans. Muslims still can’t today. The Jews were not allowed to commit this “the sin of usury” either technically. However, they had found a loophole in the text, “Unto a foreigner thou mayest lend upon interest.” Deuteronomy 23:20-21). The banking services allowed the Italian grain merchants and farmers and the Jewish bankers to thrive, and this useful relationship of lender and borrower continued into the modern day extending far beyond merchant banking. World history could have looked very different. Just imagine an America where one couldn’t get a loan for a car or home, in which there was no stock market or insurance products, where Apple couldn’t get venture capital to build its Mac, or where a system of debt and credit didn’t create an incentive of peace between historically warring nations. It isn’t just banking that allows this, but the incentive of interest. The Fibonacci Sequence: Nature’s Code. Underlying all of this is the Indian-Arabic numeral system. Without a placeholder and a zero, it is very hard to charge reasonable interest rates or do the nuanced calculations needed for modern banking. FACT: The Europeans had used to use Roman numerals until Fibonacci brought modern accounting to the west by borrowing the Indian-Arab numeral system of the east. The new system allowed for much more nuanced calculations and this helped bankers charge more reasonable fees over time (allowing for fractional monthly charges for instance). The new numeral system, the Jewish practices, and loophole, and the already established “grain banks” come together to create what becomes modern moneylending. FACT: Moneylending used to be done from benches (the word “banks” comes from the Italian word for Benches “banco,” likewise “bankrupt” is a corruption of the Italian banca rotta, or broken bench, which is what happened when someone lost their traders’ deposits. Being “broke” has the same connotation). FACT: The Jews were not allowed to hold land in Italy and, as noted above, had to live in Jewish Ghettos (where they were, at times, forced to wear red hats or other markers, so people knew they were Jews). Although they couldn’t hold land, they were allowed to trade in town centers (“the piazzas”) and in other trading centers like the halls of Lombardy. The difference between interest and discounting: Early Jewish money lenders didn’t charge interest directly; instead they used a process called “discounting” and gave a “discount” or “charge.” It is a confusing name given to the process by which a debtor obtains the right to delay payments to a creditor, for a defined period of time, in exchange for a charge or fee or “discount.” It is the process of selling “an interest” to the debtor in a specific trade, rather than just “charging interest.” It is more like charging a commission than a fee, and thus it circumvents the usury prohibition at least enough to make everyone feel they had technically followed the dictates of their religion. Ex. discount yield = “charge” to delay payment for 1 year/debt liability. TIP: Modern banking begins in Italy, but as noted above, early versions of accounting and banking can be traced to the first civilizations across the world (it is a naturally occurring system). Later modern public stocks and insurance are born. This page is solely about the origin and history of modern banking, not just the basics of banking in general. See ancient banking systems, see 20th-century banking systems and beyond. TIP: Interest can be looked at as “bad,” but this misses the point. It is the incentive to lend money. Without incentive to lend and profits, the banking industry and the economy of trade and production it allowed for would have likely not have thrived to the extent it did. Still, Dante carefully places Blasphemers and those who charge usury in Ring 3 of the Seventh Circle of Hell (in his Dante’s Inferno), so it is clear sentiment has been historically split on biblical loopholes and moneylending. What Did the Jewish Merchant Banks of Italy Do? The Jewish merchant banks performed various functions including deposits, currency exchange, financing (credit), underwriting (insurance), and even speculation. At first, their main clients were the Italian merchants, mostly grain merchants, and farmers. Eventually, their services extended to other trades and to European royalty and nobility in general as “court Jews.” “Court Jews” were the first international bankers in many respects. Mayer Amschel Rothschild, the father of international banking, was probably the most recognizable example. Providing loans to farmers at the beginning of the growing season, which allowed a farmer to develop and manufacture (through seeding, growing, weeding, and harvesting) their annual crop. Goldsmithing providing custody of valuable items and currency exchange (another thing the Jews could do and Christians couldn’t). Trading currency, as there were many different types of money in Italy and grain merchants needed a place to trade them in. Issuing insurance against future crop failures. Using bank notes, holding money against a “bill” (billette, a note, a letter of formal exchange, later a bill of exchange and later still a cheque). Speculating with money held on deposit although this risked “bankruptcy.” Lending out money on hand under the assumption that people wouldn’t make a run on the banks or fail to repay loans in bulk. This was also known as fractional reserve banking. There are also other banking practices with risk involved like speculating on future yields of crops. The First Futures: The process of selling futures also comes from these merchant banks (in this case future yields from crops). The bankers of Italy could lend to farmers against crops in the field, in this way they could secure the grain sale rights against the eventual harvest. They then began to advance payment against the future delivery of grain shipped to distant ports. In both cases, they made their profit from the present discount against the future price. This two-handed trade was time-consuming and soon there arose a class of merchants who were trading grain debt instead of grain. This practice is all well-and-good until crop failures and the Tulip bubble. If the presumed future never comes to pass, the debt that has been speculated on is worthless, and the depositor’s money has been lost. See 2008 financial crisis and speculating on futures. What causes economic bubbles? – Prateek Singh. Court Jews were the first international bankers. Then, after William of Orange and the Protestant Reformation the British and Dutch begin joining in (as Protestants can charge usury). Quickly after the first public stocks (and the first futures) were created by the V.O.C., and thus once financial products became a thing of public speculation, the first notable economic bubble in modern history occurred. 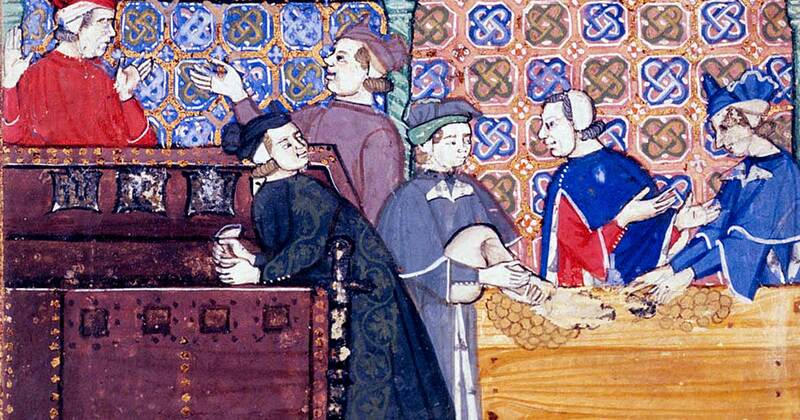 The system of banking of 12th – 15th century Italy evolved in places like Florence, Venice, and Geneva. This was the Italian city Genoa, not the Swiss city Geneva; they are both called “Genova” in Italian. The system continued until the 1500’s when the next phase began under The House of Medici, the infamous political family of 15th and 16th century Italy. The Medici took modern banking to the next step with their Medici Bank (which skirted “the sin of usury” by charging a fee for currency exchange and expanded the business by diversifying risk and creating new complex accounting practices). The Medici Bank became one of the most prosperous and respected institutions in Europe branching out well beyond Italy into other parts of Europe. According to Wikipedia, the Medici’s most notable contribution to the profession of accounting was the improvement of the general ledger system through the development of the double-entry bookkeeping system for tracking credits and debits. The Medici family were among the earliest businesses to use the system. TIP: Early forms of stocks and insurance were traded in Italian coffee shops. Both stocks and insurance can be thought of as types of insurances. Insurance can protect against a single debt not being paid or a single crop not turning out or a single trade voyage not returning home. In this way, people can reduce risk by diversifying their investments and hedging against any single failure. 100 years after the Medici Banks we find the first proper public modern stocks and insurances with the Dutch East India company in 1602 (which we explain here). Next we see the modern independent international banks like the Rothschild bank (which you can learn about here and here, and is reflected in the poem below). By the time of England’s Glorious Revolution and William III of England (William of Orange) things had changed for some of our European forefathers. From here forward, we can guess who owned stock in the free-trade confederate republics of Columbia (like Columbus, not Colombia). TIP: The rise of Protestantism freed many European Christians from Rome’s Papal laws against usury. In the late 18th century, Protestant merchant families began to move into banking to an increasing degree this includes United Kingdom (Barings), Germany (Schroders, Berenbergs) and the Netherlands (Hope & Co., Gülcher & Mulder). This helps one to understand why free-trade is such a fundamental aspect of classical liberalism (along with freedom of religion, freedom of the press, and the principles of republics and democracies). FACT: the Protestants were the first classical liberals in many ways. Catholics were at best the social liberals, but often authoritarian conservatives. The word protest is part of the name Protestant. The Protestants came to prominence due to the printing press. One of the first things they did was make up the Spanish Inquisition myth and set about attacking Catholicism by creating the West’s first printed propaganda. They are the first Christians who charged interest. From here we got the modern European and American banks including J.P. Morgan & Co, UBS Warburg, and the European and international banks named above. TIP: Knowing the above story, and considering Schroders and Berenbergs, one might ask, why did Hitler and Mussolini turn on the British, French, and the Jews in WWI? The intentions leading to WWI aside, it is related to banking in several ways. The main factor is that the economic penalties of the Treaty of Versailles in 1918 created a Petri dish in which intense forms of nationalism and socialism arose. Keynes understood the lesson immediately. Aside from Hitler’s self-image problems, he had always believed he was a Jew. The Economic Consequences of Peace combined with hyperinflation and intensely nativist response magnified his negative responses. The Treaty of Versailles in 1918 and its Consequences. French Prime Minister Georges Clemenceau said at the treaty, “Mr. Wilson bores me with his Fourteen Points; why God Almighty has only 10!”… then again, God also said something about usury, didn’t he? –Lord George Gordon Byron. Don Juan. Canto the Twelfth. This excerpt is saying that both the liberals and conservatives of all nations, including their rebellions, rely on the historically neutral international banks to finance them. This was as true then as it is now. Some lines reference more than one event in banking history from Lord Byron’s perspective in 1824. On one hand, it is referencing the Spanish conquest of South America (part of the Americas AKA the New World or “the World New”) which resulted in inflation from silver in Spain. On the other hand, it is referencing the Descamisados (poor liberal revolutionaries; of both “shirtless Spain” and revolutionarily France’s own Descamisados and its liberal leaders like the liberal banker/revolutionary Jacques Laffitte and the liberal emperor Napoleon, who was actually born in Corsica and whose Napoleonic Code broke up the Venetian Republic and, thus its Jewish Ghetto). The Columbia line is suggesting the United States (which was sometimes romantically referred to as Columbia, named after Christopher Columbus) is tied to the international banks. As we know from history, the story of the Dutch, Americas, France, England, and Italy all revolve around international banking, the Protestant Reformation, and the liberal revolutions. These three movements require a liberal mentality, especially regarding usury laws, but also regarding merchants being able to conduct business freely and worship freely and without persecution. Specifically, as we tell in the story above, the Jews driven out of Spain during the Inquisition settled in Italy, where they partnered with the Christians including some Catholics, but primarily Protestants. Only later, during the Protestant Reformation, was banking allowed to spread, as Court Jews evolved into the “Jew Rothschild and his fellow-Christian, Barings” of the world. TIP: Something to consider is that, Eisenhower’s musings aside, the only thing better for economies than war, especially over the long term, is trade, globalization, liberalization, enlightenment, and the necessary central banking which glues it together. A little peace, love, interest, and interrelated economies, where in trade and prosperity act as a deterrent to the history of war and persecution, goes a long way. War is profitable to many, and thus we have a future ahead of us where understanding the origins of economics and its role in society today is crucial. TIP: Interestingly, Ada Lovelace, the mother of modern computer code, was Lord Byron’s daughter. The Ascent of Money: A Financial History of The World by Niall Ferguson Epsd 1 5 Full Documentary. A four hour long five-part documentary on money. This video explains everything. Johnson, Paul: A History of the Jews (New York: HarperCollins Publishers, 1987) ISBN 0-06-091533-1, pp. 172–73.